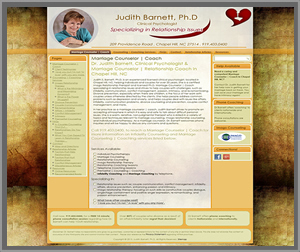 Helping people help others is something I enjoy doing, so redesigning Dr. Judith Barnett’s website was a delight! Originally we worked together on her first website and it had been successful for many years in her practice and represented her specialties as a Marriage Counselor, www.judithbarnett.com. She has another website focusing on helping people recovering from the effects of infidelity on relationships called www.afterinfidelity.com, that is also a great tool for her practice. It was time for a redesign of www.judithbarnett.com and so after working to update content and provide integration of a little bit of social media, fine tuning SEO and adding responsive capabilities, it is complete! Judith S. Barnett, Ph.D. is an experienced licensed clinical psychologist, located in Chapel Hill, NC, helping individuals and couples for over 20 years. Specializing in relationship issues, Dr Barnett now offers convenient phone coaching nationwide and internationally.